Chapter 101 presents David's proud affirmation of his commitment to the ideals of truth and integrity in his rule over the people. 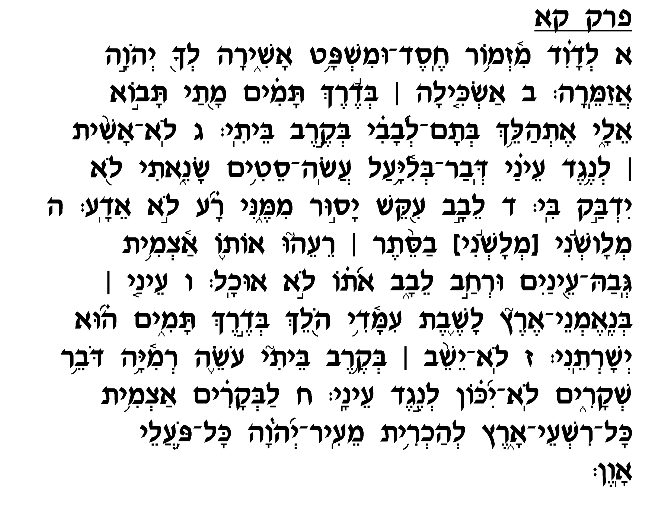 According to the Radak (verse 1), David also offers us a glimpse as to how he spent the precious moments of solitude he enjoyed in between the court cases that came to his attention. During these moments, he would "pace" to and fro in his palace contemplating God in the hope of achieving "Ru'ah Ha'kodesh" – prophetic insight (verse 2). This is how David spent his "leisurely moments" in his palace – striving for greater understanding of God and a closer connection to Him. Most of this chapter, however, as mentioned, focuses on David's firm and resolute devotion to uprightness and the elimination of dishonesty and treachery. He avows that deceptive behavior does not "stick" to him (verse 3); he is so adamantly opposed to such conduct that he could never see himself resorting to dishonest tactics. 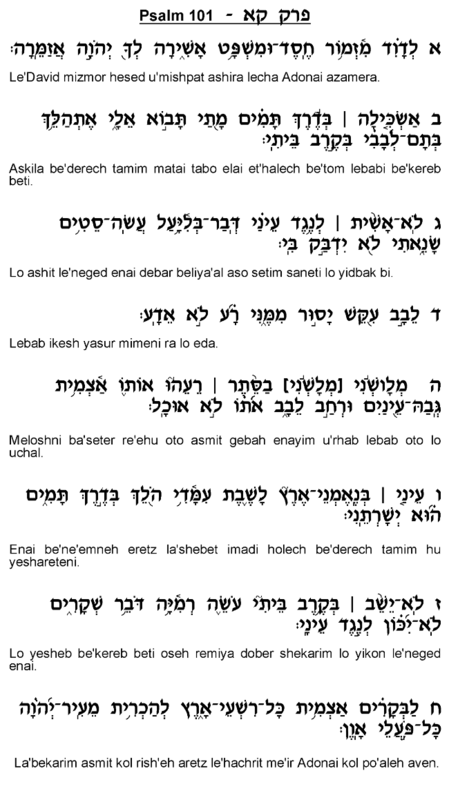 He further declares his abhorrence of arrogant evildoers and, conversely, his warm feelings of affection towards the "Ne'emane Eretz" – the honest, upright citizens of the land (verses 5-6). David does not allow cheats and frauds to serve in his palace; he made it his policy to appoint only men of integrity (verse 7). As opposed to other rulers, who overlook and tolerate the corruption and dishonesty of their servants or associates if they feel that the loyalty of these men will help serve their interests, David allows no room in his government for such people. In this Psalm's final verse, David declares that he announces each morning his goal to eliminate evil and trickery from his nation. Every monarch has a primary enemy whom he is determined to defeat or eliminate. In most cases, that enemy is a personal adversary, somebody who had challenged the ruler's ascent to his position of power. In David's case, however, the king's target is untruthfulness. David directs his feelings of resentment not to personal foes, but rather to people who speak dishonestly, who cheat in their professional lives, and take advantage of innocent, upright citizens. In David's eyes, these are the true enemies who threaten his kingdom, and their demise is his primary goal and aspiration.